EA's (Electronic Arts) Valve’s Steam and Origin services is providing new and exciting PC Games to gamers all over the world, and now they have started a new monthly giveaway campaign called "On the House" through which EA is offering Free Full Version EA PC Games to gamers at absolutely no cost. If you're gamer too then you can also Free Download Paid EA PC Games Premium Full Version Legally. How to Download Paid EA PC Games Full Version for Free & Legally? 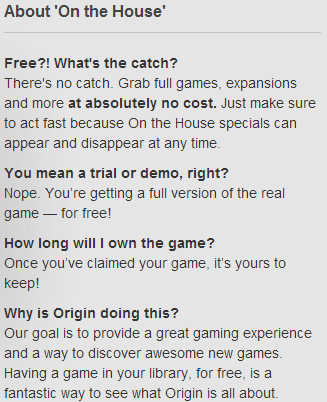 First, You will be need to Sign Up for an EA Origin Account HERE. After sign up, you will be required to install the accompanying software onto your Windows or Mac powered PC, and after that you're good to go to download free EA PC Games! Second, Click Here to Download Paid EA PC Games Full Version for Free and Legally! List of Paid EA PC Games Offered as "Freebie"
Previously in past, EA had also offered the following full version premium PC Games in its free giveaways at "On the House". Note: We will keep update this post on regular basis to provide all gamers Free Download Paid EA PC Games, So check back this post later again.